Proving Sleep Apnea is Service Connected – it’s the one thing I hear more about from Veterans than any other topic. Veterans who are looking for the “easy” way to get sleep apnea service-connected will not find it – in my opinion, there is no such thing. 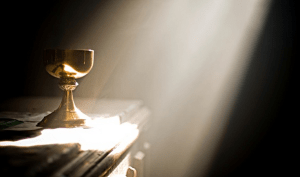 Like researchers that have been searching for the Holy Grail – the harder they look, the less they find. Listen: you have got to know this: sleep Apnea is a complex medical condition, and presents differently in each and every Veteran. While it’s not really “hard” to prove service-connection of your sleep apnea, it’s most certainly not “easy”: you are going to have to put in some “work”. 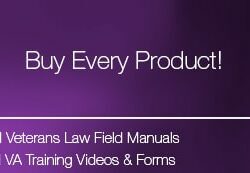 You are going to have to think through your case – as objectively as you possibly can. You are going to have to get a LOT of 5-Star Evidence. And you are going to have to present it neatly and persuasively to the VA. If I accomplish one thing in this post, it is to change the way that you think about your VA Disability Claim for sleep apnea. I don’t want you to think about the EASY path to proving Sleep Apnea is service connected. I want you to think about the BEST Path to proving Sleep Apnea is Service Connected. Here’s Why Most Veterans are not proving Sleep Apnea is Service Connected. From 2013-2014, the VA and BVA denied VA benefits for sleep apnea in 76% of the appeals. Most Veterans are not proving sleep apnea is service connected. Honestly, they are just “saying” it. 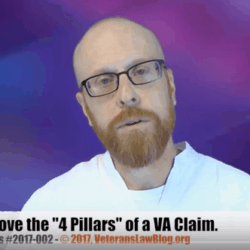 Here’s what I mean – in BVA decision after BVA decision, I saw examples of Veterans that take a look at the VA Ratings Tables, see that they can get a 50% VA rating for sleep apnea with CPAP. They then tell the VA that they have sleep apnea and a CPAP and hope that service connection for sleep apnea is granted. “I have had problems breathing and sleeping since I was stationed near burn-pits in Iraq and now I have sleep apnea”. Even with that little bit of extra information, almost all Veterans are still being denied service connection for sleep apnea. Want More Information about VA Sleep Apnea? What’s the VA’s Problem with Sleep Apnea? Even as Veterans Claims for Sleep Apnea soar, it is clear that the VA DOES NOT understand the full scope of how sleep apnea occurs, medically or factually. The VA – and frankly most of America – still thinks of Sleep Apnea as a condition for the “…obese male with a big neck.” They think – wrongly – that sleep apnea is not the kind of disability associated with a wounded warrior. To prove that sleep apnea is service connected, the smart Veteran is going to have to connect the dots for them. “Chris gave me the knowledge to file a claim for Sleep Apnea. I read his information, submitted medical documents, received a Letter of Nexus or comments from a VA contractor doctor. The BEST Path to Proving Sleep Apnea is Service Connected. I told you at the beginning – I want to change your thinking. I don’t want you to think about the EASY way to Service Connect Sleep Apnea anymore. I want you to think about the BEST path to proving that sleep apnea is service connected, and the BEST way to get the VA sleep apnea disability rating you are entitled to. *A good medical understanding of the unique CAUSE/ORIGIN (what doctors call etiology) of YOUR sleep apnea. * A good Lay and Medical presentation and assessment of the sleep apnea symptoms you have had from service, or service-discharge, to the present day. * A 5-Star medical opinion, resting on 5-Star Lay and Medical Evidence, that demonstrates HOW your Sleep Apnea is related to military service. * 5- Star Lay and Medical Evidence that show you your VA Sleep Apnea disability affects your daily life. Those are the ingredients. How you mix them is the hard part. It’s one thing to give you the ingredients for a chocolate cake. It’s an entirely different thing to mix those ingredients so that they turn into a cake. That’s what you REALLY need – you need the RECIPE for proving that sleep apnea is service connected. 4 Common Scenarios for Proving Sleep Apnea is Service Connected. 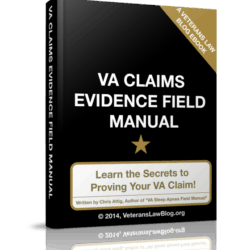 It’s no secret, I have written THE book on how to file a VA disability claim for sleep apnea. It’s over 165 pages long, and took 9 months of research. I read hundreds, if not thousands, of Veterans C-Files, BVA Decisions and Veterans Court Decisions. I talked to hundreds of Veterans who had been denied VA sleep apnea compensation. I talked to several doctors about the causes and limitations of sleep apnea. And I found that MOST Veterans with Sleep Apnea claims and appeals fit into 1 of 4 common scenarios. Scenario 1: Diagnosis of Sleep Apnea First Occurs a Long Time after Service, with no evidence of sleep-breathing problems in the Military Service, or Military Medical, records. Scenario 2: The Veteran has a current diagnosis of sleep apnea. There is evidence of sleep breathing problems in-service, in the Veteran’s service medical records, or lay evidence of these problems during the period of military service, but no diagnosis of Sleep Apnea “in-service”. Scenario 3: The Veteran has a diagnosis of Sleep Apnea in the Military Service Records, or during the period of service. Scenario 4: The Veteran has one or more conditions service-connected, and is claiming that those conditions CAUSED the sleep apnea. 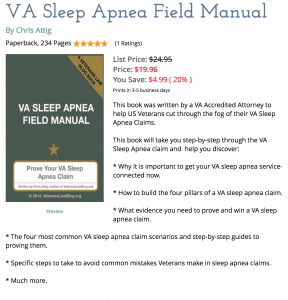 Take a look at my VA Sleep Apnea book – learn all you can about PROVING and IMPROVING your VA Sleep Apnea claim. I disagree. Many conditions that are service related can cause obesity, like diabetes (and diabetes medications), depression, and injuries that result in lack of mobility. Since many things can cause sleep apnea (like diabetes, insulin resistance, sinus problems, deviated septum, acid reflux, PTSD, heart problems, stroke, prior injuries to the head and spine, anything that deviates the diaphragm like degenerative changes of the spine, and ascites from liver disease, cirrhosis or hepatitis c), if the veteran has service connection for any of those conditions then you can add the sleep apnea as being caused by those conditions. For example, if a veteran has service connection for diabetes caused by agent orange and it is a well known fact that diabetes can cause sleep apnea, then you should be able to add it to the claim. As a matter of fact, it may be easier to substantiate with medical records that the sleep apnea symptoms started after the diagnosis of diabetes. Second example….let’s say the veteran has service connection for PTSD. PTSD can cause insulin resistance (fasting Blood sugar results above 100 prove you have insulin resistance) and insulin resistance causes sleep apnea. Hepatitis C also causes insulin resistance. There’s lots of literature available to back it up.